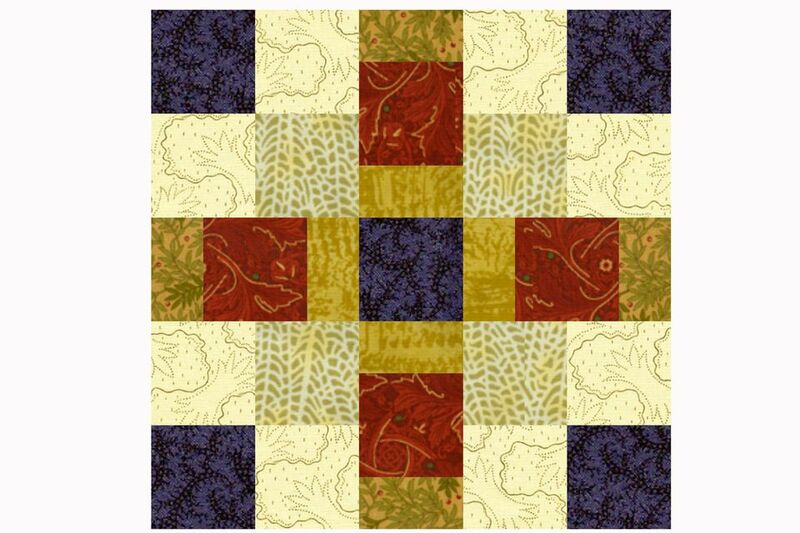 Offset Squares is an easy patchwork quilt block pattern designed in a five-patch layout. Some of the block's patchwork is divided into bars, a choice that provides lots of opportunities for color play. The quilt block is perfect for a scrap quilt project but can be used successfully in a themed quilt, too. To create a color controlled theme quilt, consider altering the outer patches from block to block because leaving those areas the same will result in one big identical area when Offset Squares quilt blocks are sewn side-by-side. Try using the same fabrics, but shift them around so that edges of adjacent blocks differ. The quilt block pattern explains how to make one 10" Offset Squares block. See the bottom of page 2 for help with fabric requirements for additional blocks. Light muted green print for squares that provide a 'backdrop' for center; make this a bit subdued so that it recedes to the background a bit. Not as light as the background, but lighter and with less contrast than other fabrics. Choose a wide assortment of fabrics to make a scrap quilt. All squares in the block are cut 2-1/2" x 2-1/2"
Narrow bars are cut 1-1/2" x 2-1/2"
The Offset Squares quilt block is strip pieced for easy assembly, and all of its patches are cut along the fabric's straight grain—no stretchy bias edges to handle. Use a quarter inch seam allowance throughout. Follow illustrations from left to right. You can improve accuracy by pressing to set seams before pressing the seams to one side. Sew a 2-1/2" x 10-1/2" blue/purple strip lengthwise to a cream background strip of the same size. 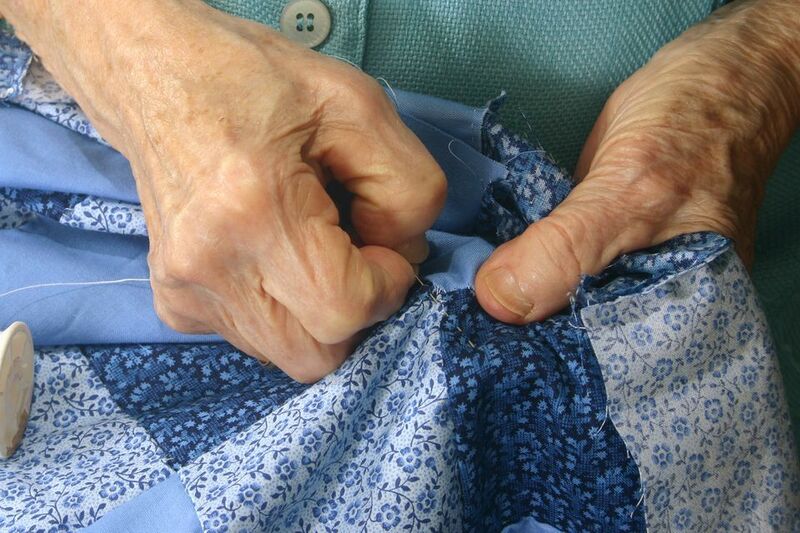 Press the seam allowance towards the blue strip, taking care not to stretch the fabrics. Square up one end of the strip set. Beginning from the squared up end, cut (4) 2-1/2" segments from the strip. Sew a 2-1/2" x 10-1/2" background strip lengthwise to a light green strip of the same size. Press the seam allowance towards the background unless it is very light/sheer. Square up one end of the strip set and then cut (4) 2-1/2" segments. Pair a Step 2 segment with a Step 3 segment to create a small four patch unit. Sew together so that light backgrounds are at a diagonal to each other. Press seam either direction. Repeat to make a total of four identical four patch units. Sew a 1-1/2" x 10-1/2 strip lengthwise to the red strip. Press seam allowance either way. Sew the remaining 1-1/2" strip to the opposite side of the red strip. Press seam allowance either direction. Square up one end of the strip set. Cut (4) 2-1/2" segments. Arrange components into three rows as shown, lower left. The plain blue/purple square is at the center of the middle row. Double-check that all fabrics are correctly oriented. Sew components in each row together. Press new seam allowances in the top and bottom rows towards the four patch units. Press new seam allowances in the middle row towards the dark center. Join the rows, taking care to match seam intersections. Press the quilt block—it should measure 10-1/2" x 10-1/2". If it's a bit off, try to square up your quilt blocks. Notice how many segments of each type are required per block—four for all but the center square. A strip of fabric cut from selvage to selvage yields about 42" of usable width. That means you can probably cut 15-16 (2-1/2") segments from each width—or enough of each segment type for four quilt blocks. Make as many segments of each type as needed. Strip widths are the same, it's only the lengths of the strips that must change. Feel free to switch colors in any way desired.